Review: Four children go on an adventure to the Lake District. While they are there they find an island and set sail to it and start a war with rival children. At the same time a mysterious man on a houseboat accuses them of a crime they did not commit. 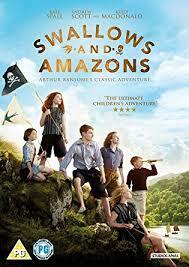 I did feel that this was very much like The Famous Five books by author Enid Blyton more than the actual story of Swallows and Amazons. The film is from a book with the same title which came out in 1930 by an English author named Arthur Ransome. Considering that most of the children that were cast had not acted professionally before I thought that they did really well. It isn’t perfect by a long way but it is very watchable. Alright to watch on a grey rainy Sunday afternoon. The main themes that occur in this film are having the skills to survive, the value of friendship and the importance of holding your nerve.